Part 1 "Why Don't We Take Better Care of Ourselves? 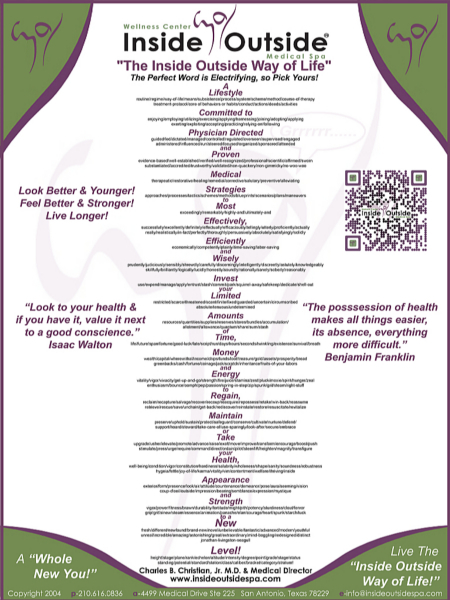 Making the Decision To Make Your Health a Priority"
Living the "Inside Outside Way of Life!" This is the first of several articles in our First Newsletter about my thoughts about the important things we need to consider if we are to life long, healthy and productive lives. This article will consider the question: Why we don’t take better care of ourselves? To be honest this was the first article I wrote in 1998 in the San Antonio Health & Fitness Guide. Nothing has changed!! During the past 25 years that I have been a surgeon, I have always been amazed at how uncommon it is to meet a person who truly has made the lifestyle commitments needed to achieve Optimal Health and maintain peak mental and physical performance. I have usually been involved with patients at late stages of various diseases such as atherosclerosis, cancer and lung diseases. When I look at their medical history, it is usually very easy, in retrospect, to see that most of them made very bad lifestyle choices along the way. Sometimes the choices were made because of lack of knowledge of the bad health effects of certain habits. For most however, the health risks of these habits were well known. So, Why don’t we take better care of these bodies that are capable of giving us such pleasure if we only take care of them? Unlike mechanical things, our bodies have constant repair mechanisms which are very efficient at keeping us healthy. Why don’t we develop even the simple habits which we know are good for us? I think the reason is based on a lack of self respect, self esteem, call it self love. If we truly valued ourselves as unique and wonderful creations, capable of living extraordinary and productive lives we would act differently. One of my favorite books is written by Og Mandino, a well known motivational author. The book is entitled “The Greatest Secret in the World”. That’s it. It is that simple. Value yourself, love your self. You are worth it. Make your health a priority. 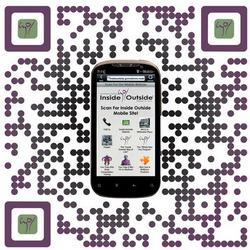 The Staff of Inside Outside has made their decision and we stand ready to help you when you make yours. This newsletter is part of their dream to help you with your quest for Optimal Health. Everything in life starts with a decision. The "Inside Outside Way of Life" is just a decision away!! Don't delay, Make it today. One of the characteristics of a unfulfilled life is we tend to think that "today is not an important critical day." Become your own "Project', or "In life's great experiment, you are the pig, stop hurting the pig!" "My Health, Where Do I Start"
"6 Components of Optimal Health and Aging"
Doctor (gen.: doctoris) means teacher in Latin and is an agent noun derived from the verb docere ('teach'). 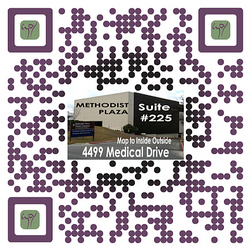 Dr. Christian teaches in the San Antonio area about how best to use your Limited Time, Money and Energy on Nutrition, Exercise, Preventive and Skin Care Strategies. His 45 min “6 Components of Optimal Health and Aging” or the “Hi-Lo Strength Training” or “Basic and Specialty Skin Care Products" or "My Health, Where Do I Start & What Is It Going To Take?" seminar is perfect for any audience. If your group is interested in these topics, please contact us 210.616.0836 or email info@insideoutsidespa.com. 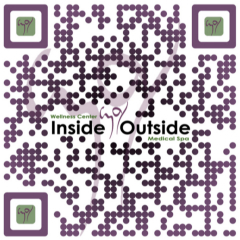 For our Members, this is a great way to indirectly tell all your friends about Dr. Christian and what we do at Inside Outside. Share with them the "Inside Outside Way of Life!"